Equal Pay Day: a symbolic day dedicated to raising awareness of the gender pay gap. On average, women still get paid less than men. Equal Pay Day marks the point in the year at which we effectively start working for free. This year it falls today. 51 days until the end of the year. Women now earn nothing. Equal Pay is the fight that we had in 1970 with the Equal Pay Act. It's the fight we thought we'd won. Equal work and equal value means women have a right to equal pay and yet today it is clear that is not the case. The current 13.9% pay gap will take around 62 years to close if we keep going at the same rate of progress as we are now. 20 years ago the gap was 76 days so the date would have fallen almost a month earlier, 16 October. 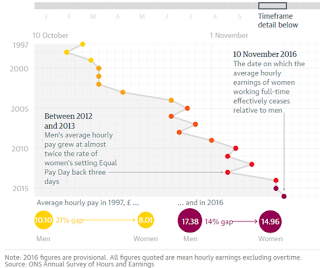 Even since last year this has narrowed from 14.5% and Equal Pay Day fell earlier on November 9. This improvement is great to see but it has not been consistent and it defintely isn't enough. Between 2012 and 2013, men’s average hourly pay grew at almost twice the rate of that of women. Why is this?! It is no single person's fault. It's not an organisation's fault but it's society as a whole who makes it acceptable in the modern day and age to let this practice continue. Today marks the day we need to change. We need to continue to spread awareness and promote this startling inequality between gender. We can't wait 60 odd years for it to be equal. We need to start today. Right now. Women are still fighting for that basic recognition. We do the same job, at the same level of work and of the same value. But we must work to change attitudes. Women should be able to make it to the top with much more ease and be given the same opportunities as men. Women are undervalued and that has to change. It’s time to end pay inequality once and for all. It’s time to close the gap because women’s work is of #equalvalue. *Details from Telegraph, ITV and Metro websites.